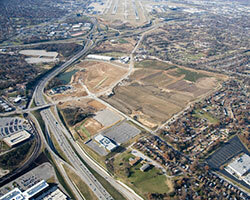 STL offers multiple properties for development in the immediate vicinity of the airfield. These site solutions include numerous development sites on or bordering the airfield, as well as privately developed business parks, distribution centers and logistic centers that are in close proximity of STL. Suitable for both aviation-related and non-aviation-related businesses, these properties can provide your business with the right land solution, right now. 123-acre site located northeast of the airfield. It is bordered by an access road to the north, an interstate linkage on the east and an airfield frontage road on the south and west. 238-acre site located west of the airfield. Approximately 3,500 feet of the site runs along a taxiway servicing Runway 11/29, providing access to STL’s runway/taxiway system. 313-acre site located west of the airfield. It is bordered by interstate linkages on the north and east and can be reached by access roads from both the west and south. 95-acre site located south of the airfield between Runway 11/29 and a large public thoroughfare. The site is directly adjacent to a mix of commercial and residential properties and bordered by an interstate linkage on the west. 155 acre site located one mile north of Saint Louis International Airport and within the State of MIssouri Enhanced Enterprise Zone. It offers immediate access to multiple interstates and is served by the Norfolk Southern Railroad. 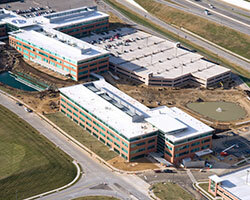 528,000 square foot property located within the Airport Enhanced Enterprise Zone. The property offers 36 existing dock doors, four drive-in doors and build-to-suit office space. 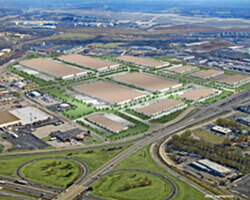 151 acre site located near St. Louis International Airport. The site enjoys excellent highway access and is served by Norfolk Southern Railroad, making it ideally situated for an industrial park or distribution center.